Last week we were asked if we considered Microbirth to be a success. But we define success differently. After Microbirth was screened at a film festival in Prague last year, an eminent Czech obstetrician in the discussion panel gasped and declared that his country was decades behind the times and that change needed to happen right now. We make the films we make because we want change to happen, whether it’s to advocate for gentle birth or to demand respect for the rights of mothers to choose where, how and with whom they give birth. 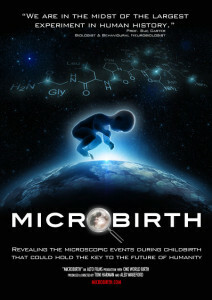 We made Microbirth because we feel passionately about the potential harm that is being done to the long-term health of our children simply because people have not heard about the important microbial processes that are taking place during childbirth. The seeding and feeding of a baby’s microbiome is new science that needs to be understood by parents as well as healthcare professionals. We see it as our job to help bring this new scientific understanding to as wide an audience as possible by bridging the gap between scientists and the people. But, we can only succeed in this if people get to see the film. We understand that many people cannot afford the higher prices of specialist subject DVDs. And while we struggle with the rising costs of manufacturing and international postage, we know we have to do our bit to make the film more accessible. So, in celebration of Microbirth’s television premiere, we have decided to cut the price of the DVD for a week. We’d love to be able to offer this for longer, but we do also need to raise funds so we can complete the next film which is a direct follow-on to Microbirth. ​If you already have a DVD, then please let other people know about this limited availability. The good news is that change is starting to happen, but we need to make this change happen even faster and the way to do that is to get the information out there! Thank you for your continued support. Your kind messages and encouragement mean the world to us!